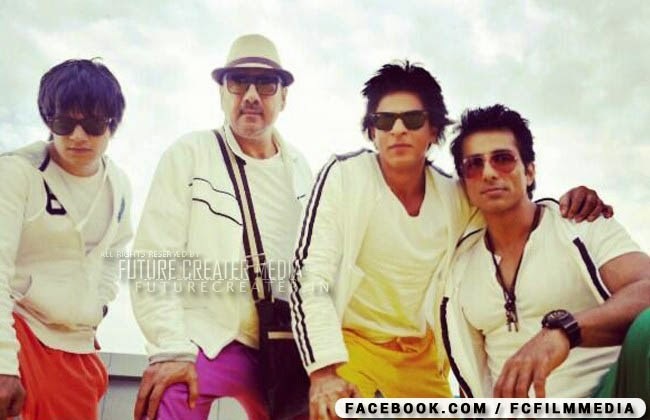 “Was good to have 2/3 of the HNY team together for the shoot. From tom hectic & hot shoot,” Shahrukh Khan tweeted and shared a photo. Sonu Sood also posted a photo. “Frankly speaking it’s our director @TheFarahKhan who makes us look so cool..#HNY,” he wrote. Happy New Year has been shot in Dubai and Mumbai. The film also stars Abhishek Bachchan, but he is presently shooting in Shimla for another movie titled All Is Well with Asin. The new look of the Happy New Year cast has them all looking fresh and young. The movie stars Shahrukh Khan opposite Deepika Padukone yet again. Boman Irani, Sonu Sood, Abhishek Bachchan and Vivaan Shah play pivotal roles. Happy New Year is slated to hit theatres this Diwali.